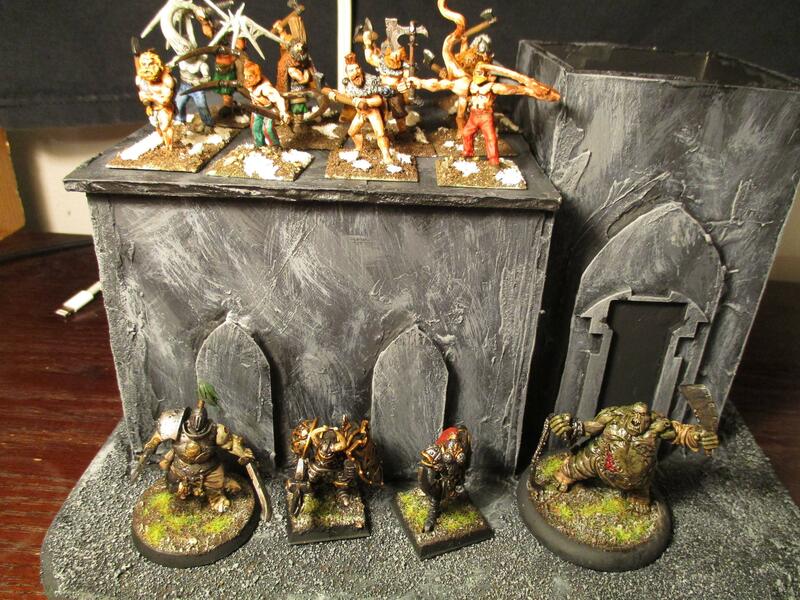 We have our Path To Glory campaign at Phantom of the Attic in Pittsburgh on Sunday. 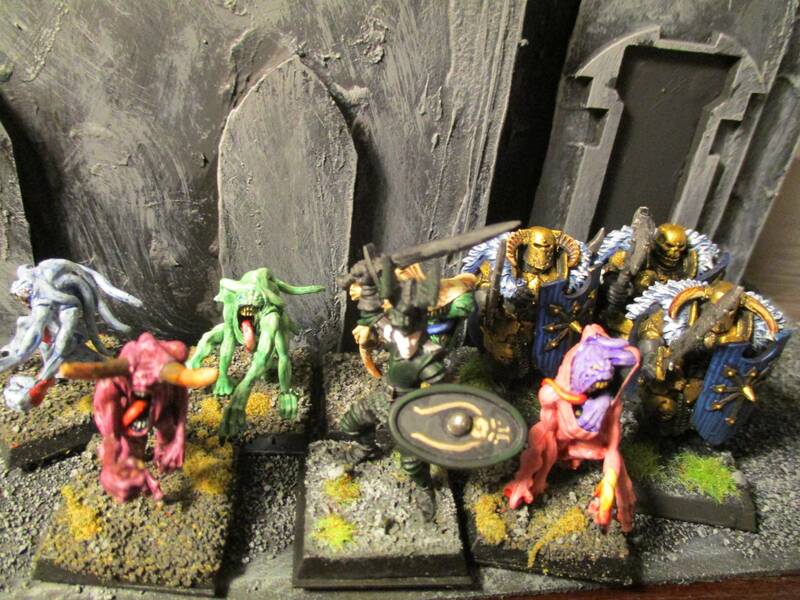 Here are some of the Warbands players will be using for the games. 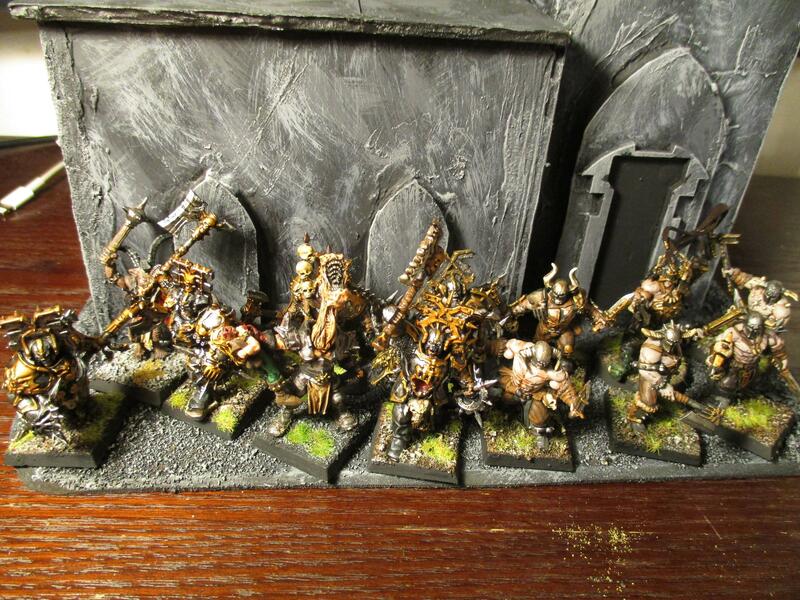 With a mighty champion leading some blood warriors, blood reavers, a blood stoker and even a lonely Beastman Gor. The Champion himself is already on his way to daemonhood. The smallest of the war bands, led by a guy that bears a striking resemblance to a certain Eternal Champion, he has 5 Horrors and 3 Chaos Warriors with him. Slaanesh creeps in next. His champion and crew are currently abandoned by their decadent god who is sleeping one off. It could be why this mortal champion has attracted so many beasts to his banner. With 9 marauders, 4 Gors and 2 Harpies he has a sizable band but no one is going to be too tough. That putrid stench you can sense is Nurgle's war band. Possibly the toughest one in the lists, the forces of Nurgle have a shocking 13 marauders as well as 2 blight kings for a combination of numbers and killing power. A Chaos warrior rounds the force out to a total of 17 models including the champion. An aspirant to the glory that is Archaon's is out here too. Learning to harness all the powers of Chaos this champion has attracted not only 7 marauders and 3 harpies but even a power apprentice sorcerer to his cause. What he lacks in numbers he may make up for in ranged attacks. Unless he has to fight the Horrors in that Tzeentch force. 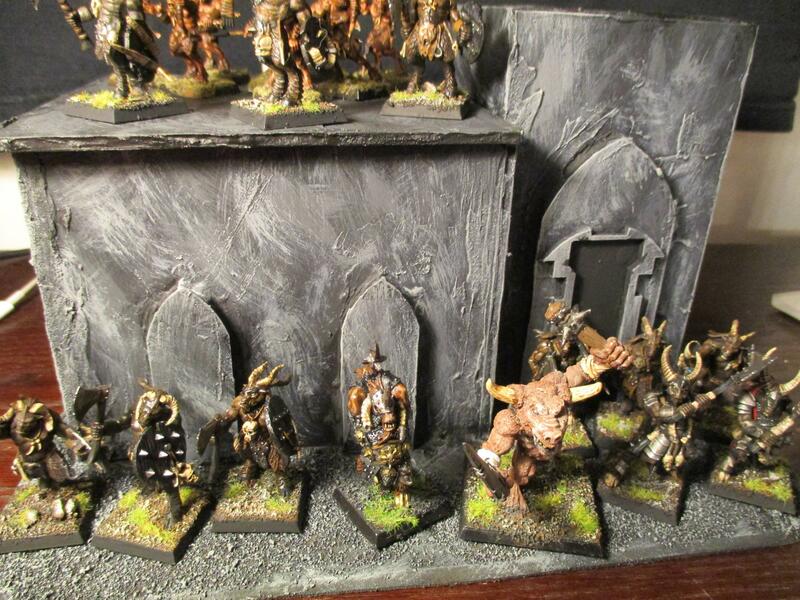 Finally we have the Beastmen who are probably responsible for any stenches not caused by the Nurgle war band. These guys have 6 Gors, 8 ungors, 2 bestigors and a bull Gor all lead by a Beastman champion. This war band is not to be underestimated. Limited in their variety of reinforcements, their starting force has shooting power from the ungor bowmen, a solid core of infantry between the Gors and Bestigors and some hard hitting power from the Bullgor. Looking really good. I'm a bit ignorant: is Path to Glory an Age of Sigmar thing? 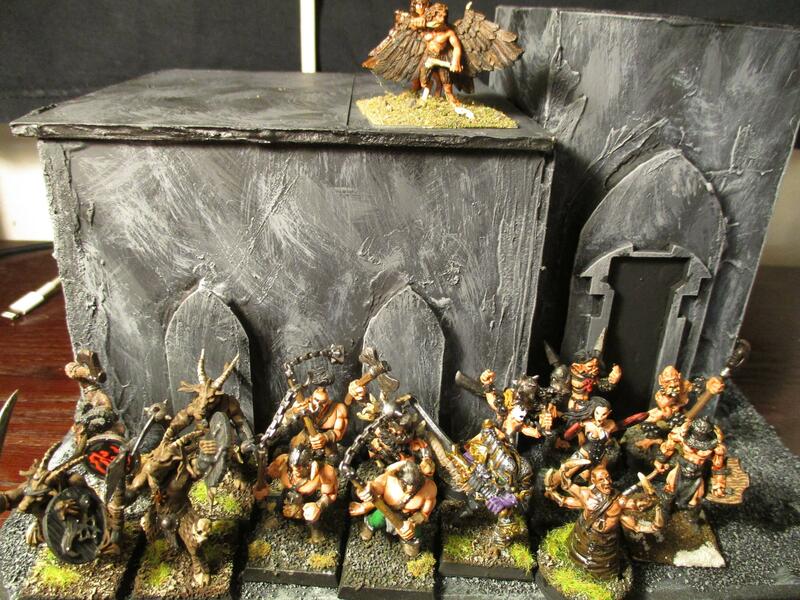 Looking at the warbands reminds me of Realms of Chaos, which I never got into, but sounded like lots of fun. Path To Glory is a supplement that GW published in 2002. It is a campaign style system where you get a chaos champion and then so many points to spend on a war band. You have to roll randomly to see what warriors turn up for you to recruit into your little force. Then you fight against other war bands. As you win games or do certain things in games you get more favour points with which to recruit new troops to replace the ones that died in the previous game. After you get so many favour points you also get to roll on a chart to see if your character advances. There are a number of ways he can get better, characteristic increases, special God inspired talents and mutations. He can even turn into a daemon prince if you roll well enough. 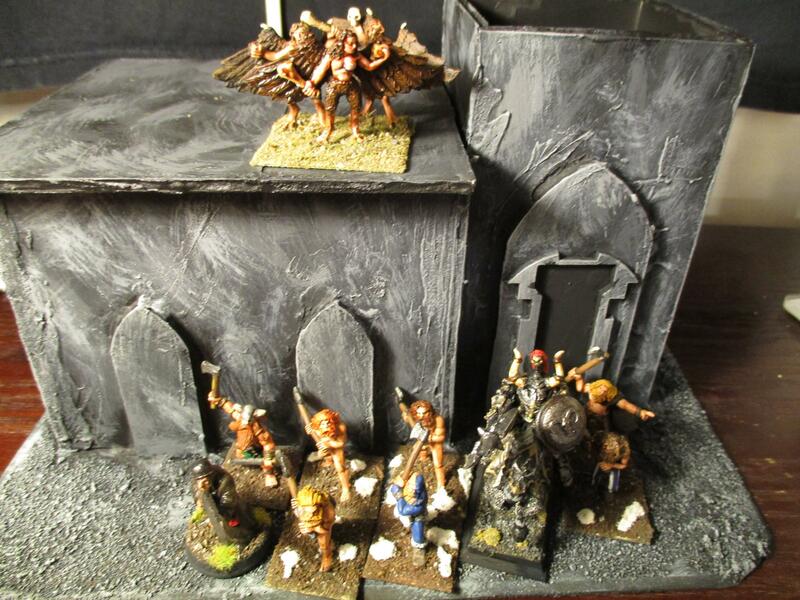 It is just a nice excuse to get a lot of models on the table and get them fighting each other. The supplement was free, if I remember correctly. I have a few of them lying around. Sounds vaguely similar to what I remember about Realms of Chaos. Sounds like heaps of fun too! Haha! This event is the number one most upvoted event in Pittsburgh for this weekend.